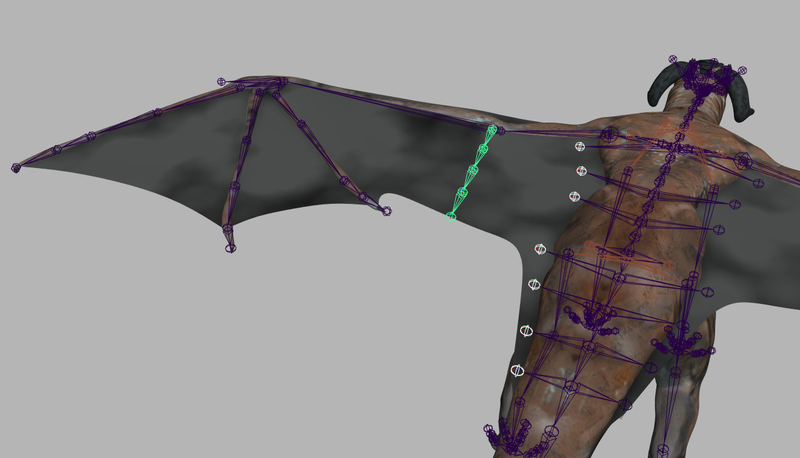 I originally approached the wings using a similar setup to a Bat rig I did some years ago; which was to keep things fairly simple with only creating joints for the arm and fingers, and skinning the entire membrane to those joints. Unfortunately, due to the size of the membrane, this approach didn’t deform too well during animation and it was too easy to create ugly creases. I elected to compensate for this by including more joints where the membrane meets the body to help maintain spacing. 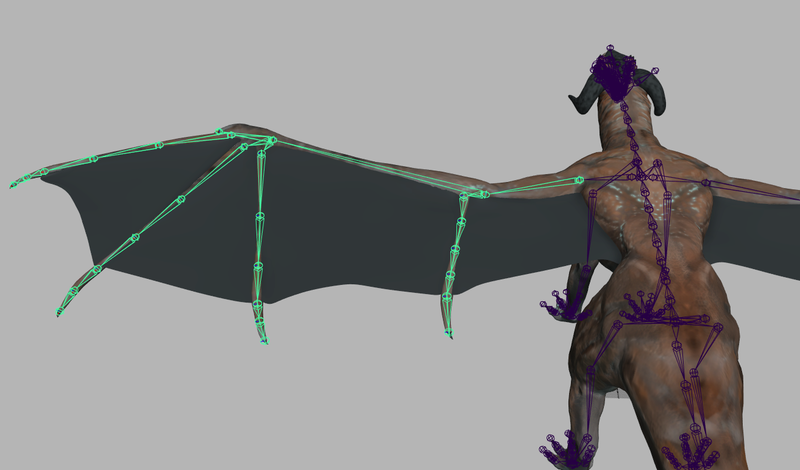 I also added more joints along the membrane to help animators deal with the volume of the wing. This approach ended up being a failure as well, there were simply too many moving parts for the animator to wrestle with. Additionally, we only ended up pushing creases around instead of flattening them out for a better deformation. The team went back to the drawing board, and we decided the shape of the wings was simply too complex, as the membrane was attached to so many parts of the dragon’s body, it didn’t really mimic real-world anatomy enough for us to come up with a good animation solution. This in mind, I dusted off my drawing skills to do a paintover on the proposed shape of the wings that Rob should aim for. don’t laugh at my drawing. It got the idea across, at least! With a much simpler wing design, I was able to revert to my original design with good results. The wings behaved during most animations, and I added some additional control to offer a “billowing” effect for some secondary control. This entry was posted in Articles, Main, portfolio and tagged cogswell, freelance, maya, portfolio, quadruped, rigging. Bookmark the permalink. 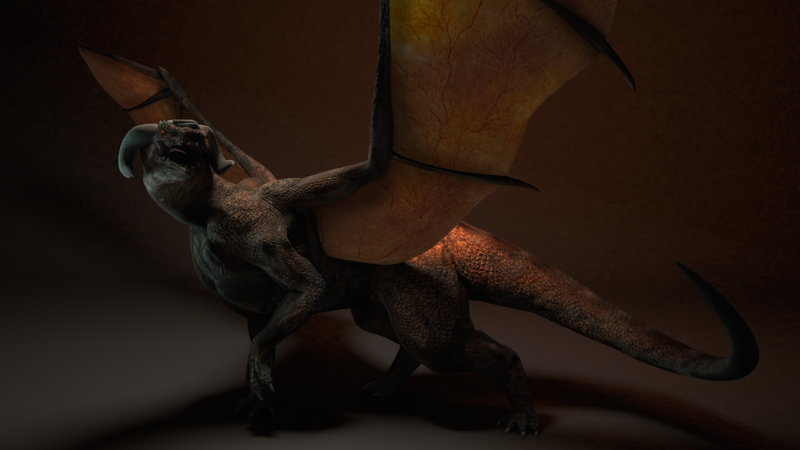 I’m a filmmaker, and designing some dragon wings to add to an actor through CGI. 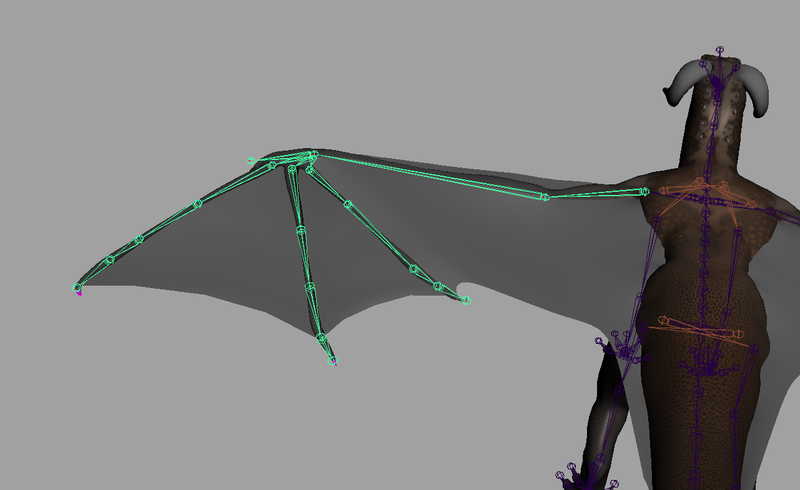 I really like your wings, and membranes, but I’m having a lot of trouble figuring out how to rig the membranes. Can you walk me through the process to get them to work correctly? I’m working in 3dsmax. My email is iowadude41@yahoo.com. I’d really appreciate your help on this. 1. Might wanna check the “Temperence_Rig_REF:ctl_right_wing_finger_middle3” and “Temperence_Rig_REF:ctl_right_wing_olecranon3” controls ……. you’ve named the successive controls as same the these..resulting in various errors while importing and exporting animation.